Marathi Nav Varshachya Sarvana Shubhechha (Happy Maharashtrian New Year). Like many other festivals, the Maharashtrian New Year is also a harvest festival. Gudi Padva marks the beginning of the traditional Marathi new year. It is celebrated in Maharashtra on the first day of Chaitra month(it is also known as Chaitra Shukla pratipada) to mark the beginning of the Marathi new year. Gudi padwa(in Marathi) is also celebrated in other parts of India by different names. This day is considered extremely auspicious. 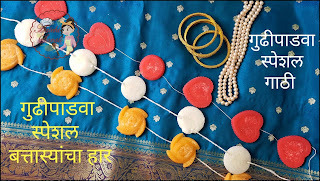 Gathi chi mal or Batasha har is must have sugar candies in this festival celebration. In India, we can buy batasha from any grocery store, but after moving to the USA, I had difficulty to get one perfect, areated gathi mal here. I checked for Batasha har in the Indian grocery store here in the USA, and I found separate batasha packed in plastic packets. However, on checking carefully, I noticed that many of them were crumbled in the packet and I dropped the idea of buying them. And prepared Batasha har at home by myself with multiple shapes, colors, and flavors. Voila!! Making Gudhi or batasha har is a simple process in which sugar is boiled in water until the syrup reaches a harder consistency. 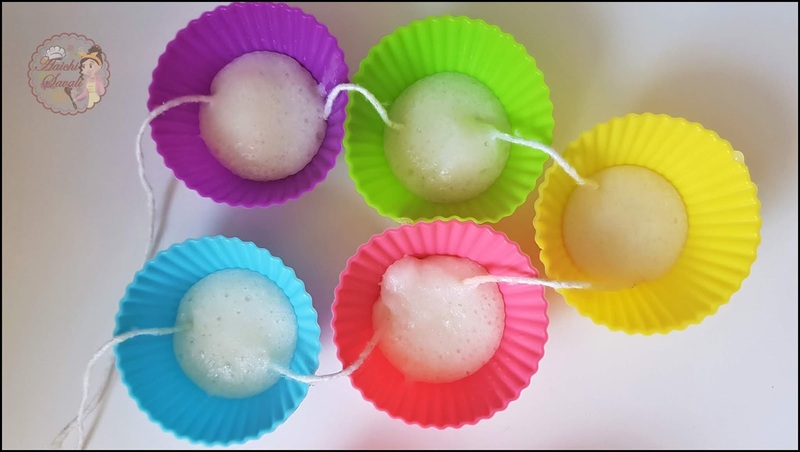 Soda bicarbonate is added to aerate this syrup, and the chashni is dropped on to mold. And here, all set to celebrate Gudi Padwa. Why Gudi Padwa is celebrated? It is believed that Brahma created the universe on this day, so it is the first day of the Hindu New Year. Gudi is believed to invite prosperity and good luck into the house. The most important thing is that it is one of the three and half auspicious days of Hindus/Sadetin muhurta. How Gudi Padwa is celebrated in Maharashtrian House? On the day of Gudi Padva, people raise the Gudi(flag) on the right side of the main entrance of the house. The gudi comprises of about 6-7 feet long bamboo stick and new colorful cloth or new saree, Gathi / Battashacha har (garland of sugar, neem leaves hooked up at the upper end and then kalash with Swastik made by kumkum on it, is placed at the top where the saree is tied or attached. This Gudi is raised at the time of sunrise and to be taken down before the sunset. There is one more tradition, and it is that on this day people start their day by eating neem leaves and jaggery mixture. It is said that eating this bittersweet neem jaggery paste purifies the blood and strengthens the body. Naivedya/Prasadam or food to celebrate Gudi Padva? Shrikhand-Puri / Aamras-Puran Poli is one of the most popular sweet dish made in this day. 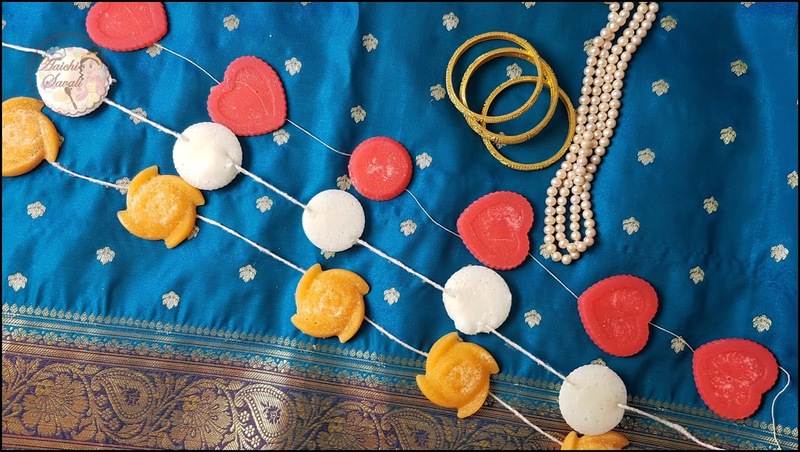 Gathi is the most important thing in the Gudi Padwa festival, and it is an edible garland /jewelry prepared by using sugar, water and Fruit Salt(Eno)/Baking Soda. 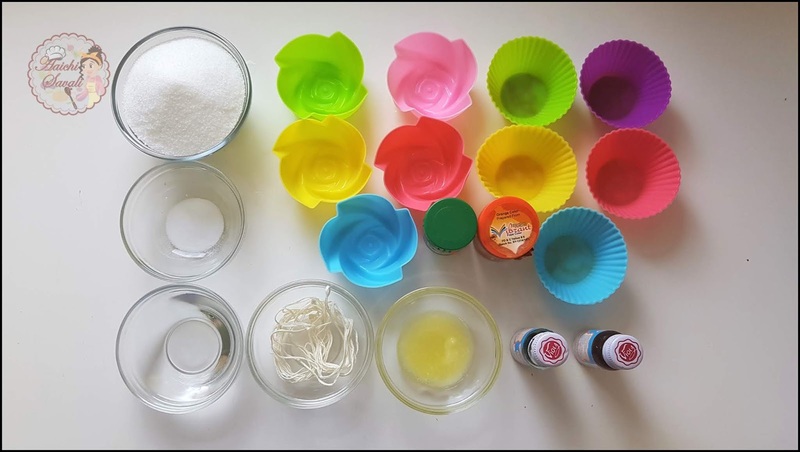 Gathi can be prepared in various shapes, sizes, and colors. 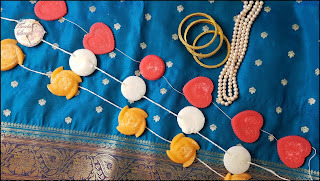 This edible jewelry/ Gathi is a big hit among young and old alike given its decor value or taste. Gathi has 5 to 9 padaks, with one waghnakh or champakali in the middle. 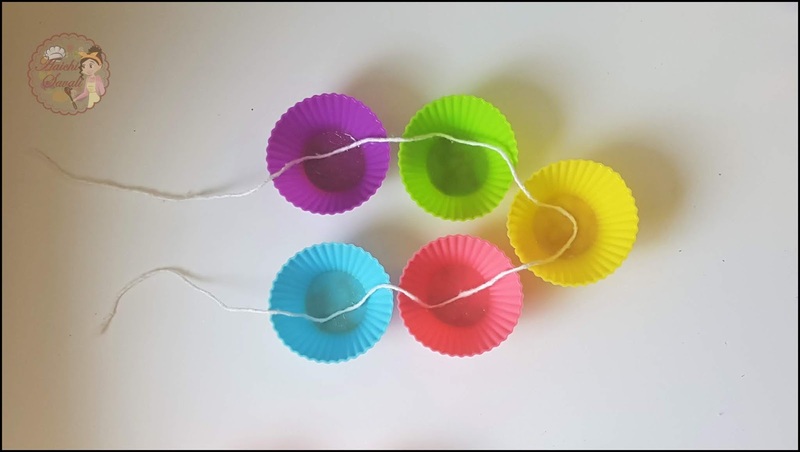 Here I have prepared and decorated ghathis using different colors, and shapes. Given measurements and time makes 2 medium sized gathis with 4 padaks and 1 waghnakh or champakali. 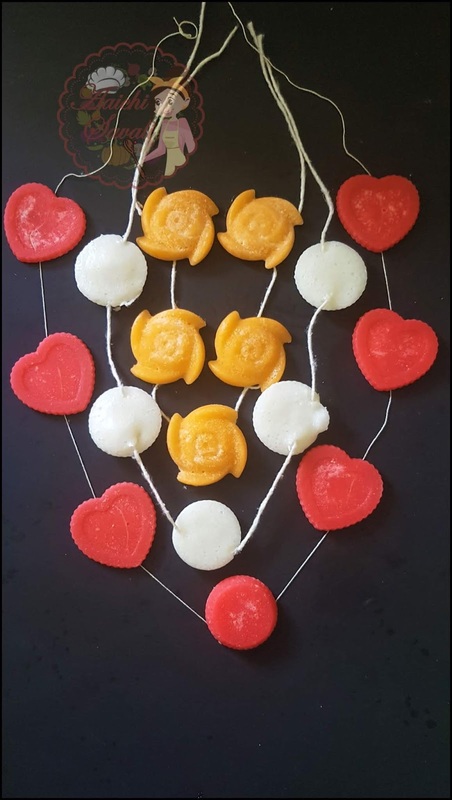 Each padak weighs approx 12-15 g. I have used rose essence along with red food color and mango essence along with orange food color. Also have used different shape molds (heart, round and flower shape molds). If you don't find molds, you can use wide plate too. It needs just 10 minutes to cook, and 5 minutes to set, that means in 15 minutes homemade gathi is ready. So let's gets started! Set Time: 5 Minutes; Total Time: 15 Minutes. Grease the silicone molds with ghee and arrange them with no gap in between them. 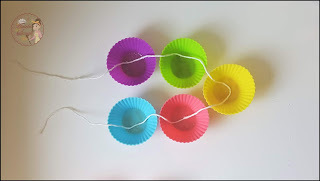 Put Cotton String into the mold (refer video to get the exact idea). In a pan heat sugar and water and keep stirring continuously on medium to low flame. Stir and cook until the sugar gets completely dissolved. Keep mixing until thick consistency sugar syrup forms(it will take approx.7-8 minutes). 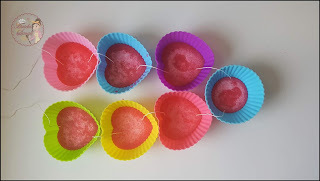 Check consistency by pouring the sugar syrup into the bowl, and it should look like a dewdrop that means sugar syrup is ready. Now add fruit salt(Eno) and stir well. 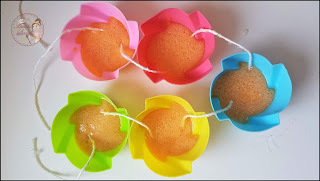 Pour prepared sugar syrup immediately into arranged molds and let it dry for 5 minutes. After 5 minutes demold gathi gently. Tadaa, sweet and homemade gathi to celebrate Gudi padwa is ready. Once sugar syrup thickened, add food color and essence of your choice and mix very well. Transfer syrup immediately into the molds and let it set for 5 minutes. 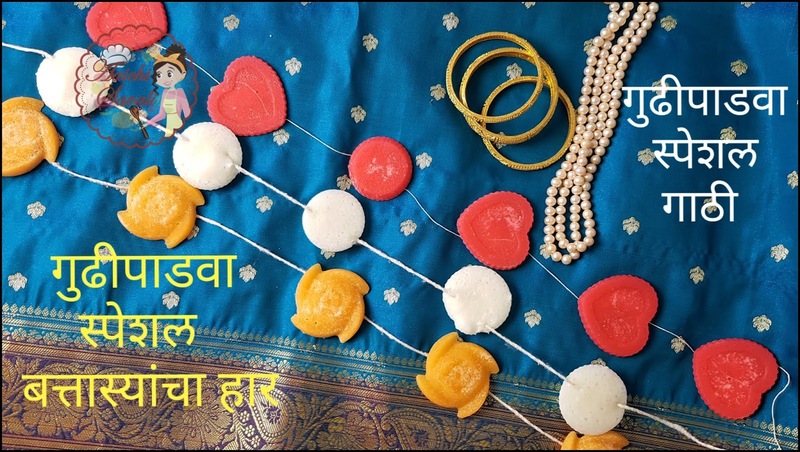 Colorful and flavourful Gathi Battashacha Har Sugar Garland is ready. Enjoy!!!! 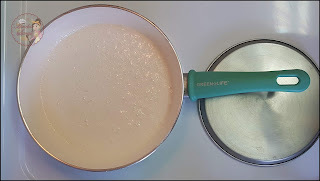 If you don't want to use baking soda or fruit salt, then you can totally substitute it by adding ghee 1 Tsp. Addition of fruit salt makes Gathi light, aerated, translucent and perfect. One Padak of Gathi/Batasha weighs about 12-15 g.
Given measurements makes 2 medium sized Gathi. 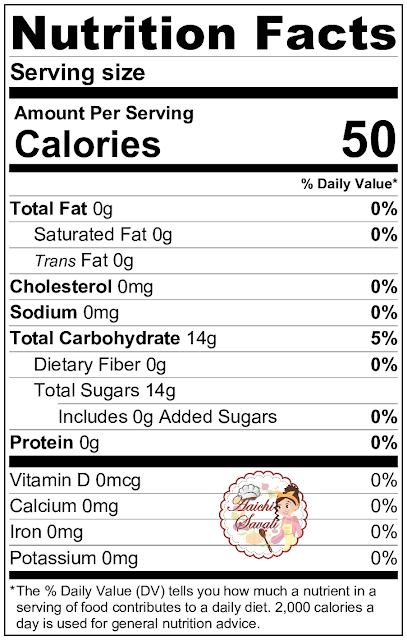 Calorie count is based on a 2000 calorie diet. Per serving contains 50 calories, along with 14.28 g carbohydrates.